A tourist boat carrying 76 people has capsized in a lake in the southern Indian state of Kerala, killing at least 37 people, officials said. The state-owned double-decker boat was travelling in the remote Thekkady forest reserve when it went down. The boat tipped over after the tourists rushed to one side as they spotted some elephants, officials said. Fifteen people are missing and 24 have been rescued. Survivors said the boat had few lifejackets and no lifeguards. Rescuers have pulled out 37 bodies and are still searching the area for survivors, state home ministry official Abhiraj Basheer told the BBC. Two foreign tourists who were on the boat swam to safety, he said. Most of the tourists were from the neighbouring state of Karnataka, officials said. The dead included a group of at least a dozen people from the Indian capital, Delhi, they said. The brand new boat was owned by the government-owned Kerala Tourism Department Corporation. The government has announced a compensation of 500,000 rupees ($10,500) to each of the families of the dead. A judicial inquiry has been ordered into the incident. Kerala is a popular tourist destination for both Indians and foreigners. It is famous for its beautiful beaches, temples and wildlife sanctuaries. 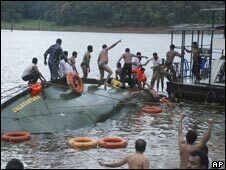 In February 2007, at least 18 children and four teachers died after a boat carrying school students capsized in Periyar river.